And that’s probably why you’re here. You know the benefits of doing PR: earning trust, establishing valuable relationships, and building branding awareness, all while collaborating with content and social media marketing, but with lower costs than traditional advertising. Well, sure it does. But which tactics should you execute? Where do companies start developing plans? And what does effective PR even look like in real life when it encompasses so many things? 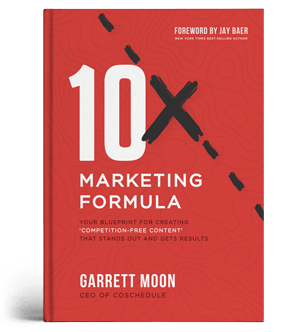 That’s what you’ll find in this post: 30 examples demonstrating what this time-tested marketing discipline look like in the real world. 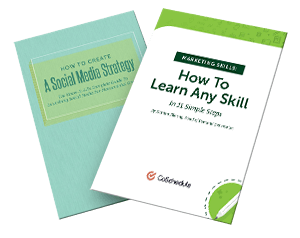 You’ll find basic stuff like different areas of the business you can explore, plus tons of actual campaigns to help inspire your own strategy. What is CoSchedule? It’s the best all-in-one marketing management platform to organize all your projects and team members. See it in action. This post is full of examples you can borrow ideas from. But, what happens when it comes time to execute your strategy? 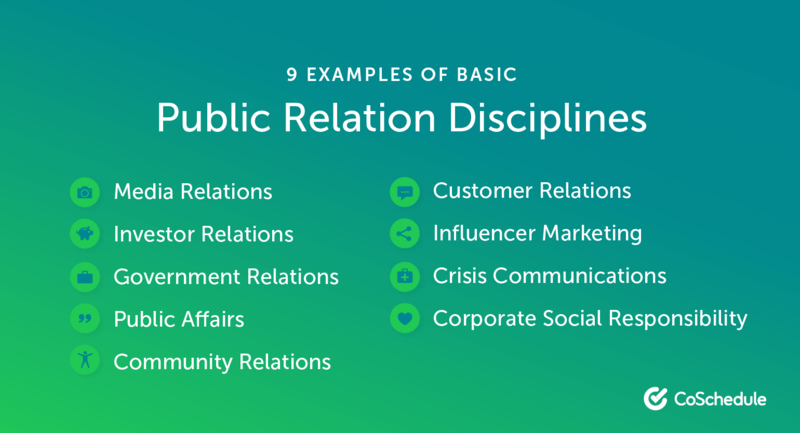 So … What is Public Relations, Really? This is a bigger question than it might sound like. 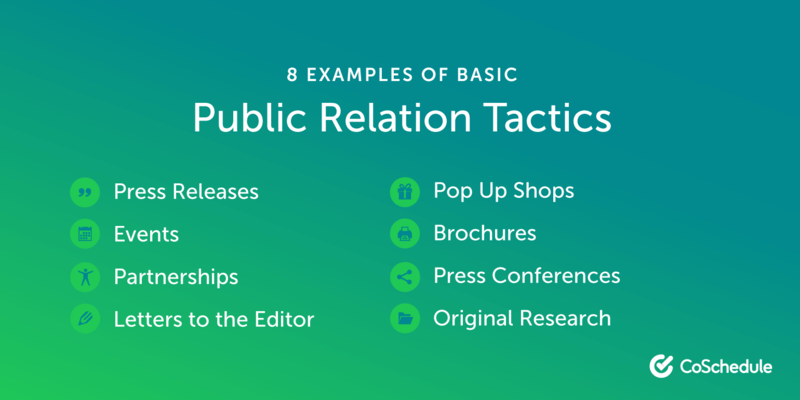 Public relations describes the actions a business or organization takes to shape perceptions of its brand and develop relationships with its customer base, target audience, partners, and other important stakeholders. If you’ve got a job in this field, or if you’re responsible for executing any part of it, that could mean a lot of different things. Some of this might seem basic, but it’s worth reviewing, because it’s possible there may be work you’re doing (or could do) that you didn’t even know fell under the PR umbrella. 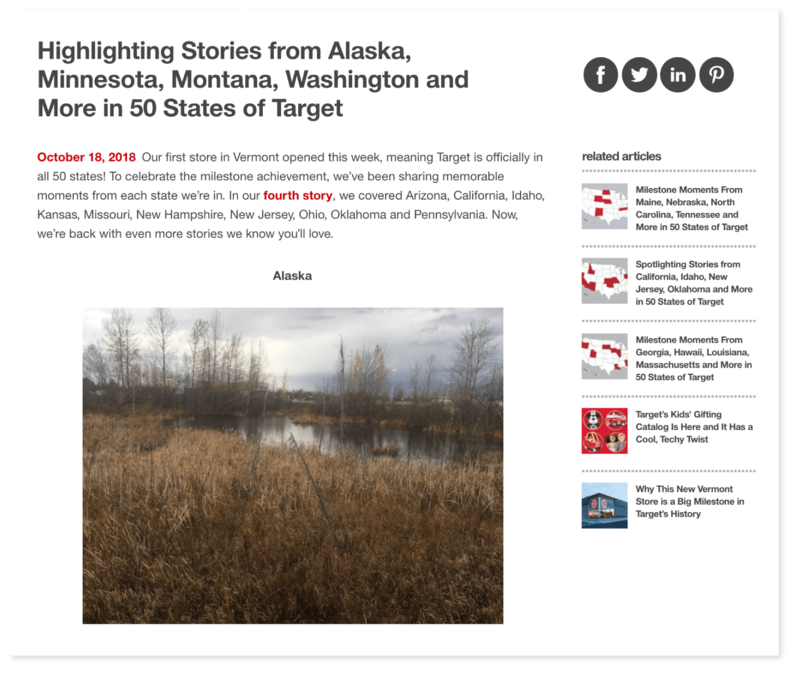 Old-school landing placements in reputable news outlets and publications. This is all about building relationships with reporters and editors and securing favorable coverage. Most often, this involves cold pitching, distributing press releases, and connecting on social media. You want to keep corporate investors happy. That’s what investor relations is all about. Companies and organizations that interface with government agencies have a need to manage those relationships well. And conversely, governing bodies need to manage relationships and perceptions with their constituencies and stakeholders, too. Companies, organizations, and nonprofits often have a need to manage the connection they have with their surrounding communities. This can also extend to online communities and community management. Beyond just customer support, how do companies shape perceptions and build relationships with their customer base? Strong customer relations can go a long way toward building brand loyalty without relying on advertising or content alone. This one is a hot topic these days, but it isn’t often openly discussed as a PR tactic. That’s a good reminder that PR is dictated by its goals, and not just the tactics and channels used. Bad things happen. When they do, it’s someone’s job to manage the fallout, ensure that the right information gets out fast to people who need it, and stop problems from spiraling even further out of control. That’s where crisis communications come in. 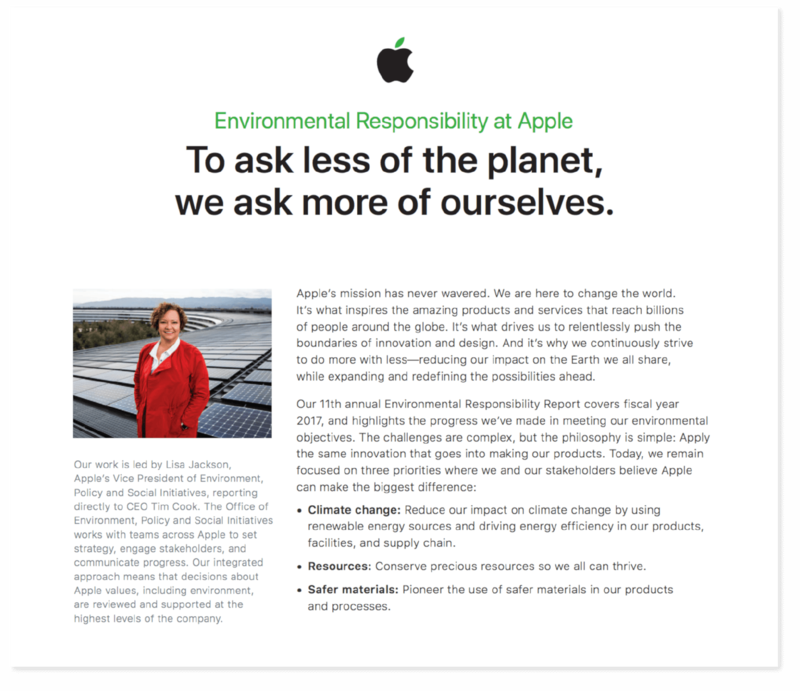 In the modern era, people expect companies to act responsibly and to be good stewards of natural resources. CSR helps businesses show what they’re doing to make a positive impact (and in turn, build goodwill with potential customers). Companies sometimes put PR into a limited box of tactics without stepping outside those lines. But, doing so might be limiting your opportunities and ability to connect with audiences. Here are some obvious (and not so obvious) tactics to try. This is the tried-and-true, bread-and-butter media relations tool. Relatively speaking, press releases are a cost-effective outreach tool. That’s worth keeping in mind, considering “65 percent of communications leaders said the tightening of budgets” is a top-three challenge. Plus, 92% of consumers trust earned media. Placements in news publications, blogs, websites, and magazines are viewed as trustworthy, and building trust is a key goal here. From small fundraisers to major conferences, events are an effective way of growing your community, getting your brand out there, and developing partnerships. Those are all essential goals of public relations. One way to grow your audience is to leverage someone else's. If building support for a cause or issue is part of your organization’s goals, a letter to the editor of your local newspaper (or newspapers in areas you serve) can be highly effective. These can be written on behalf of your organization, or by members advocating for your position. Pop-up shops aren’t just an effective way to capitalize on cheap retail space or seasonal shopping trends. They can also be an effective means of earning media coverage. Good, old-fashioned print collateral still has tons of value. If you have a physical presence, leaving people with information they can take with them is a useful way of ensuring they come back. Press conferences remain an effective means of getting a message out to a large group of reporters all in one shot, and not just for pro athletes in post-game interviews, either. Journalists love to cite original research in their own work. So, doing your own research on a topic and sharing that content can be an excellent way to position your company’s expertise. So, what does absolutely awesome PR execution look like in real life? That’s what this section will take a look at. And not only that, it’ll look at some un-flashy but effective work you can emulate too. The ALS Ice Bucket Challenge was more than a viral video sensation. It was also started by The ALS Association and raised an incredible level of awareness around the need to find a cure for an extremely serious illness. It gave people a cause to rally behind. Doing good feels good. The campaign encouraged people to participate. Giving people a chance to show off on social media is an excellent way to get them engaged. There was an element of fun and creativity. The novelty of the campaign caught people’s attention. Those three things together added up to one of the most effective viral campaigns in recent memory. While social media was the medium it used, its goals were rooted in pure PR. Book promotion takes a lot of work. Tons of books get published every year, and standing out isn’t easy. It’s promoting a cause. People love to feel like their purchases are help advancing an important issue. The book is raising awareness of the organization, too. Plus, by raising awareness of Charity Water, people might be more inclined to continue donating and supporting their mission. Partnerships are clearly displayed. If you have a website page or landing page promoting something, including either places to buy the product or partnering organizations is smart. Another example of leveraging partnerships and issue-driven messaging, the Google Impact Challenge connects the company with nonprofits, lending funding and the help of Google volunteers to winning organizations. Setting high stakes. Google is a big entity with massive resources. Taking on big issues. And as such, they’re able to do big things that get a lot of attention and help advance tough problems in a meaningful way. Actively encouraging participation. They’re actively raising awareness for everyone who enters (even if they don’t win) just by giving them exposure. 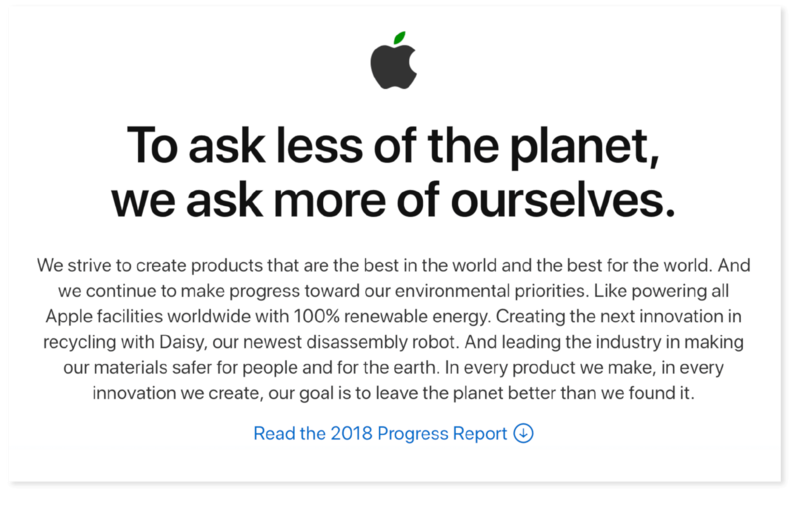 Another example of corporate social responsibility, Apple goes to great lengths to communicate what they do to benefit the environment. Invest in quality long-form communication materials. 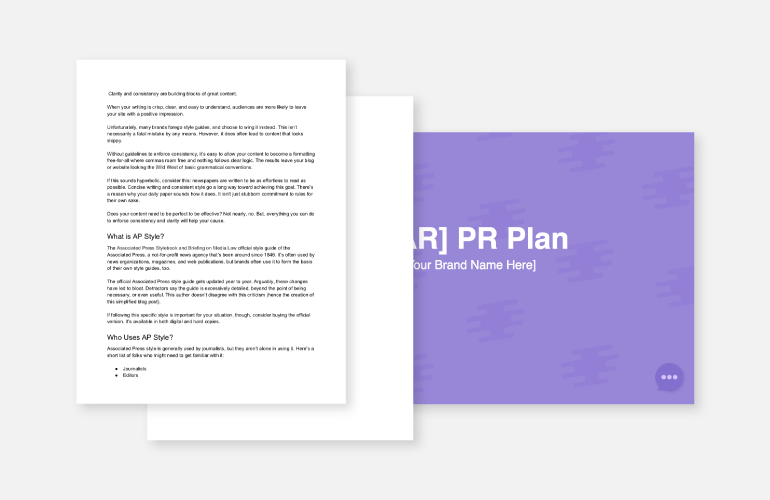 White papers, annual reports, and case studies are all valuable PR tools. Have actual data to back up your claims. Tell the truth! If you’re going to talk the talk, then walk the walk. Your organization needs to actually do good before you can accurately communicate what you’re doing right. Again, make your communication materials well-written and well-designed. Presentation matters when it comes to shaping perceptions. Give readers a TL;DR version. Highlighting key stats gives Microsoft an opportunity to point out some major achievements even if people don’t download the report. Make PR materials easily accessible. The call-to-action is clear, right at the top of the page. Want to amplify your brand’s exposure? Partner with someone who can help you reach new audiences. In this example from Lyft featuring retired pro baseball player David Ortiz, they were able to generate tons of exposure by doing something surprising with a well-known celebrity. Identify someone your audience knows, who also has some public recognition. This could be someone from a partnering company, a local community figure, anyone who is well-liked and has a solid public presence. Find something surprising they could do. The partnership in the example above works because no one expects David Ortiz to be their Lyft driver. What else could you think of with your own influencers? Products and places that are universally loved are easy to promote. But, what if you’re promoting something with, well, charms you could argue are hidden? By being brazenly honest, they’re able to show people what makes Nebraska worth visiting, instead of trying to tell people the state is something that it’s not. While this is an ad campaign, there’s an earned media component too, with the campaign generating tons of media attention. Be honest. No amount of PR spin can make you something you’re not. Play to your strengths. It turns out there’s a lot you can do in Nebraska, especially if you’re the kind of person who likes to make their own fun. Whatever your strengths are as an organization, lean into them. Embrace humor. It’s okay to laugh at yourself a little bit. Get involved in local communities you serve. Make charitable donations, volunteer, or find other ways to make an impact. Tell those stories. Your blog is a great place to highlight those stories. Then, with some smart outreach, you can earn more coverage and backlinks. What better way to get people interested in a product, other than to let them try it? Well, when it comes to mattresses, that can get a little tough. So, IKEA partnered with Havas Media to create apps that helped people envision what their perfect bedroom arrangement could look like. They also sponsored slumber parties inside IKEA stores. The results? Increased awareness of their bedroom product lines and tons of earned media. This one is worth including because it’s one of the most well-known and long-lasting marketing messages ever created. The result of a collaboration between the U.S. Forest Service and the Ad Council, the goal was simple: get people to care about stopping forests from burning down. It makes people a sense of responsibility. It’s also easy to remember. Bears, man. Maybe when a bear tells you to do something, you do it? Who knows. 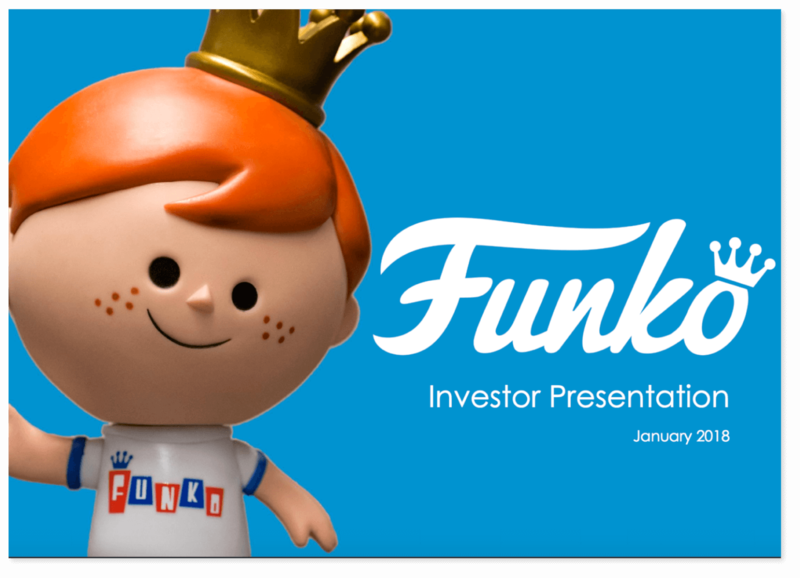 Investor relations doesn’t have to be dry and stale. Sure, it isn’t the time nor place to get too cute or creative. But, you can still put time and effort into making investor relations materials visually engaging. Make information easy to find. Don’t bury important numbers and figures. Add graphics. Charts, graphs, and data tables are great for making information digestible. Be true to your brand. You don’t stop being who you are just because you’re crunching numbers. Never underestimate the power of a well-written press release, backed by strong distribution.